Polished surface of NWA 3136. An oriented 95.1 g shield-shaped stone with partial thin, pale brown fusion crust found in Algeria or Morocco was purchased in Tagounite by a Moroccan dealer for A. and G. Hupé (xHupé) in 2004 April. The specimen has a thin, dark weathering varnish, but the interior is a very fresh, black, hard, vitreous-looking rock with small white to yellowish clasts. 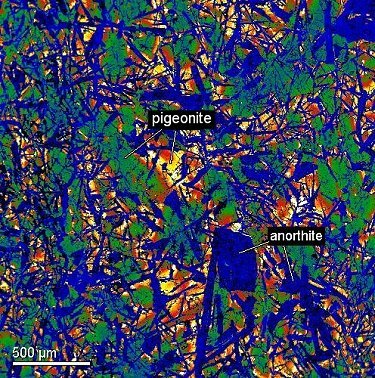 Classification and mineralogy (S. Kuehner and A. Irving, UWS): Polymict breccia consisting of mineral and lithic clasts derived predominantly from mare basalt and mare microgabbro lithologies, and additionally some highlands clasts, in a very fine grained, mostly crystalline and partly vitreous, vesicular matrix. 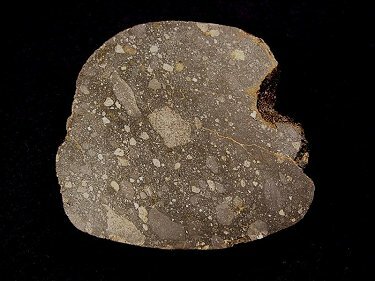 Mineral clasts include calcic plagioclase (An86-97), pyroxenes (orthopyroxene, ferropigeonite, ferrosilite, pyroxferroite; FeO/MnO = 68.9-75.8), olivine (mostly Fa30-43, but ranging to nearly pure fayalite; FeO/MnO = 81.9-94.2), ilmenite, Ni-poor Fe metal, troilite, Cr-bearing ulvöspinel, and rare pentlandite, baddeleyite, and a Ce-Ca-Fe-bearing, Zr-rich titanate (probably zirconolite). A further description can be found in (Kuehner et al., 2005). Bulk compositions (R. Korotev, WUSL): INAA of several subsamples indicate that this specimen is dominated by mare components with ~20% lunar highland components (Korotev and Irving, 2005). Oxygen isotopes (D. Rumble, CIW): analyses of two whole rock fragments by laser fluorination gave δ18O = +5.83, 5.96, δ17O = +3.06, 3.10, Δ17O = -0.03, -0.05 per mil, respectively. Specimens: type specimens, 19.5 g, two polished thin sections, and one polished mount, UWS; main mass, xHupé. 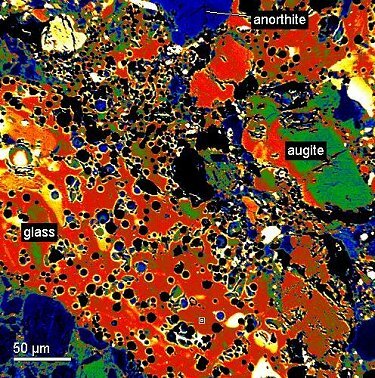 O’Donnell S. P., Jolliff B. L., Zeigler R. A., and Korotev R. L.
(2008) Identifying the mafic components in lunar regolith breccia NWA 3136 (abstract). 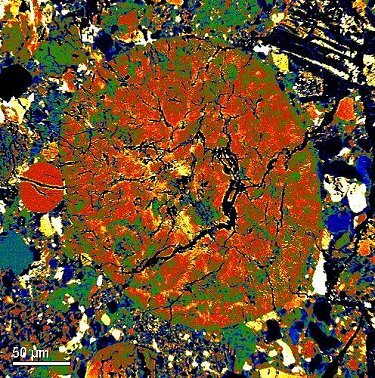 Nishiizumi K. and Caffee M. W.
(2006) Constraining the number of lunar and martian meteorite falls (abstract). 69th Annual Meeting, Meteoritical Society. Korotev R. L and Irving A. J. Northeast Africa 001, and Northwest Africa 3136 (abstract). 36th Lunar and Planetary Science Conference, Houston. Kuehner S.M., Irving A.J., Rumble D., III, Hupé A.C., and Hupé G.M. 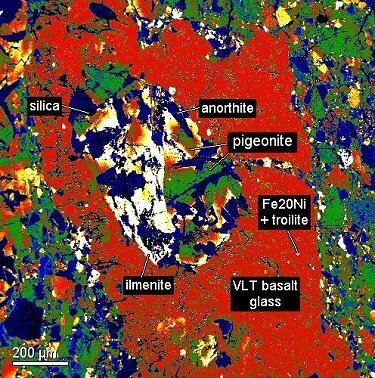 A glass-welded mare regolith breccia of mixed heritage (abstract). Lunar and Planetary Institute, Houston. False-color BSE image showing vesiculated matrix. False-color BSE image showing glass spherules. False-color BSE image showing big basalt clast. False-color BSE image showing melted basalt clast.